Three-parent baby legislation approved in free vote by UK House of Commons. 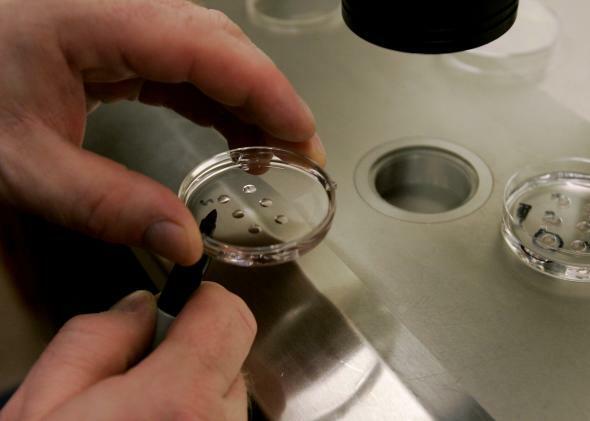 A dish of human embryos at the La Jolla IVF Clinic. In the British House of Commons on Tuesday, members of Parliament voted 382-128 to amend the Human Fertilisation and Embryology Act of 2008 and allow an in vitro fertilization procedure that cures a particular set of genetic conditions, called mitochondrial disease. The treatment creates “three-parent babies,” because it uses genetic material from a female donor in addition to a mother and father. The House of Lords will vote next to approve the procedure. Mitochondrial disease is characterized by problems in the cell mechanism that is supposed to produce energy for the body. Mothers pass affected mitochondria to their children, so the IVF treatment replaces their mitochondrial DNA (a small fraction of total DNA that doesn’t code for identifying traits) with a second woman’s intact mitochondrial DNA. Roughly 0.2 percent of the DNA of children born after the treatment comes from the donor. The treatment has been controversial, in part because of bioethical questions about genetic modification and the meaning of genetic parenthood. If legislation moves through the House of Lords as well, the United Kingdom will be the first country to allow “three-parent babies.” According to BBC News, “Estimates suggest 150 three-person babies could be born each year” in the U.K. if the procedure is approved. Member of Parliament Fiona Bruce opposed approval of the treatment. She said, “[This] will be passed down generations, the implications of this simply cannot be predicted. … Once these procedures that we’re asked to authorise today go ahead, there will be no going back for society.” The Church of England also opposes an amendment to the Human Fertilisation and Embryology Act. The safety of the IVF treatment has been evaluated extensively. The Human Fertilisation and Embryology Authority completed three independent reviews of available research. The Nuffield Council on Bioethics also conducted an ethical review over six months. If approved, the U.K. would establish a board to review applications from fertility clinics to offer the procedure.